Average 30-year fixed-rate mortgages declined by 22 basis points from 4.28 percent to 4.06 percent, resulting in the biggest single-week decline in rates since 2008, according to Freddie Mac’s latest Primary Mortgage Survey released on Thursday. Freddie Mac chief economist Sam Khater said the drop is due to the Federal Reserve’s economic outlook, which predicted slowing economic growth. “The Federal Reserve’s concern about the prospects for slowing economic growth caused investor jitters to drive down mortgage rates by the largest amount in over ten years,” he explained in a prepared statement. 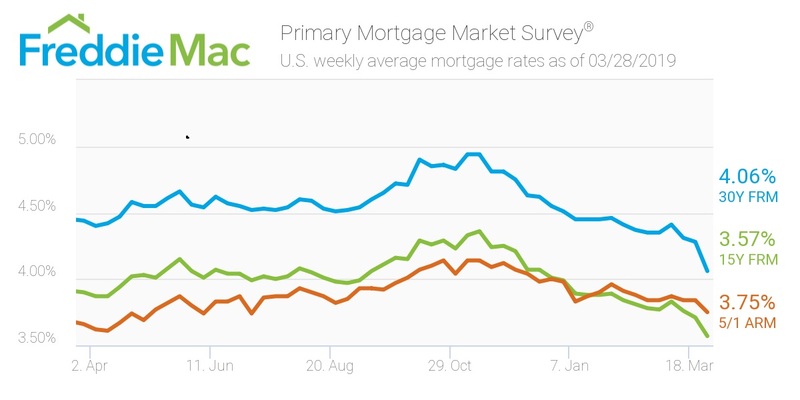 Freddie Mac chief deputy economist Leonard Kiefer responded to the Primary Mortgage Survey results through a series tweets, which drove home the point how rare the 22 basis point drop is. “One-week changes this large are pretty unusual,” he explained on a tweet accompanied by a color-coded chart listing weekly mortgage rate trends over the past 48 years. On the flip side, the dramatic drop in rates is expected to drive up home sales as buyers prepare for the spring home buying season. Bankrate economist Deborah Kearns estimates the lower mortgage rates will save buyers approximately $15.85 each month for every $100,000 they borrow in comparison to last week’s rates. “At the current 30-year fixed rate, you’ll pay $487.27 each month for every $100,000 you borrow, down from $503.13 last week,” she explained.